Brooks was diagnosed with Acute Lymphoblastic Lymphoma (ALL) in March of 2016. He was just 17 months at the time. Brooks is a crafting maniac and loves playing (anything) with his big brother, Max. Dance parties with Daddy are always a favorite, but nothing beats snuggling with Mommy. Brooks is a serious cuddle bug. We are grateful for the devoted attention LLS gives to finding a cure. We know it is their dedication that has improved the course of care for Brooks and helps to ensure his future. Light The Night is a chance for us to share in a special community of love and suport. "God trusted you to carry Brooks through this." I have always held that dear. It helps me to realize that I wasn't being punished, rather I was entrusted. Light The Night and LLS mean everything to me. Within the first week of being diagnosed with APL Leukemia, my mother reached out to LLS as a resource for me and they were that and so much more. 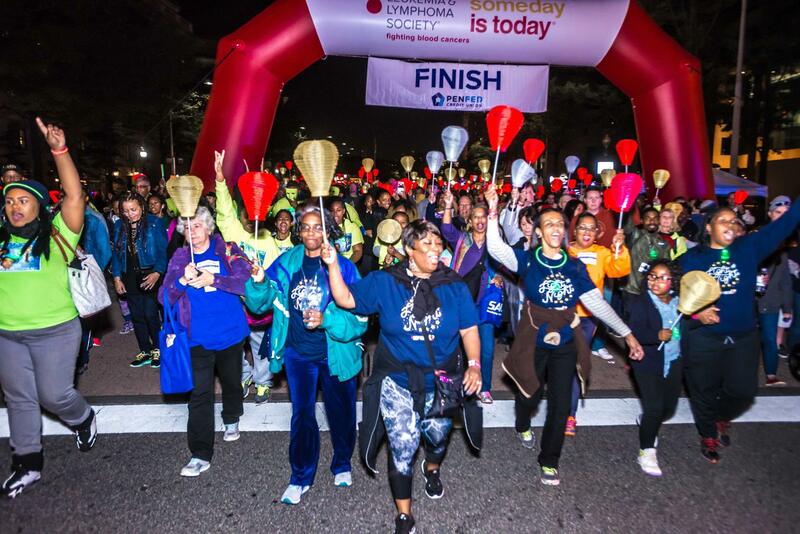 Two years after my diagnosis and subsequent remission, I became a team captain for Light The Night in Rockville, MD. Over the years, my team, INVICTUS, has been comprised of my children, family, friends, and strangers. Light The Night is and always has been a night of humility, strength, pride, and remembrance. To see people come together for a cause that is so close to my heart is awe inspiring and a reminder of the how and why I am so proud to be part of The Leukemia Society and Light The Night. "It won't be an easy journey; it will humble you, make you stronger and wiser, and test everything in you, but always know that God is walking beside you." LLS has been a lifeline for me: from funding drug research that has extended my life, to providing me a platform to give and receive support. When I got sick again last spring I faced what was by far the toughest chemo regimen I've had in 8 years. As I sat there, with yet more poison dripping from my IV, I thought it shouldn't be this hard to try to survive. There has to be a safer, more tolerable treatment. The treatment ideas are out there, and LLS is working tirelessly to get them to those of us who need them. That's why I fundraise on their behalf. Fundraising for LLS is a labor of love for me. I hope you'll join me in supporting their mission by making a donation to this year's Light The Night walks. At 6 years old Michael was diagnosed with T-cell Acute Lymphoblastic Leukemia. Since then he has endured multiple spinal taps, bone marrow biopsies, numerous different chemotherapies, countless pills and radiation. Due to an infection he was on homebound instruction, so he missed the entire year of 1st grade with his friends at school. After 4 long months of steroids and intense chemo, Michael was able to return to his normal leukemia treatment and began the task of getting stronger and getting better. In September of this year, Michael was able to start normal days with his second grade class. He was able to join his baseball team again with his buddies and instead of sitting the bench, he was suited up and ready to play. He has kept his faith and helped so many of us grow ours as we’ve watched his fight. He is truly a miracle. Starting December 2017 Michael will finally be finished with his leukemia treatment and looking forward to a very bright future.